Sometimes, no matter how hard you try, you end up late no matter how ahead of time you plan things. That happens to me ALL the time. 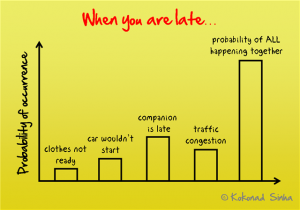 I am, by habit, a fairly punctual person. But you never know, sometimes a series of unfortunate events totally mess things up. Sometimes, it doesn’t matter. Other times, you get judged. 😀 And you curse the fact that the day even happened. It’s as if God has a grand scheme of things planned out for you – but you never see it! Heh heh. In my continuing series of Thoughts in 2D, here’s my latest. 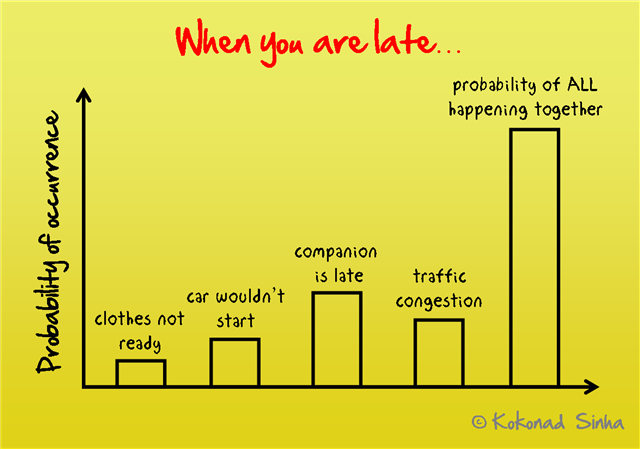 lol…happens to me too often….probability of the freaking cata bus coming early that day is high too. LOL!! well that’s life…I guess it happens with everybody. man I’m now self-confessed fan of ur 2-D representation of life! I think next time I’m stuck in some prob , please chalk out a graph for me..I’m sure 3-D prob reduced to 2-D will be easier to solve .. LOL! What to me tops getting late is a friend/roomie who is hopping along and spends hours in front of the mirrior dressing the part!!! Gawd my pet peeve! Ha ha ha ha ha ha! That was amazing! Even if they all happened together and you did claim it, Kadambari’s point would come true! To sum up your “Thoughts in 2D”….. brilliant!! Two thumbs up!